Would Charlamagne Tha God ever co-host a show with Tomi Lahren? Syndicated radio show host Charlamagne Tha God discusses Tomi Lahren's firing from Glenn Beck's 'TheBlaze' network, and addresses rumors that he's actually friends with Lahren despite their on-air sparring with one another in 2016. Charlamagne Tha God: "Women have been the CEO's of our lives since day one"
Carl Reiner to Trump: "You're probably the worst president any country's ever had"
No more mohawk for Mr. T? Larry King: It’s Tomi Lahren, isn’t it? Larry King: Why was Lahren fired? Charlamagne tha God: Well she got fired because she’s on a conservative network, which is Glenn Beck’s network, and she went on ‘The View’ and basically said she was pro-choice and that a lot of conservatives are hypocrites. You know, if they’re not pro-choice, then—I kind of knew that was going to happen because I felt like Tomi was saying a lot of things that necessarily weren’t her opinion, so she was just saying things cause she was getting such a great reaction from them, and I always say that people who do that eventually crash and burn. 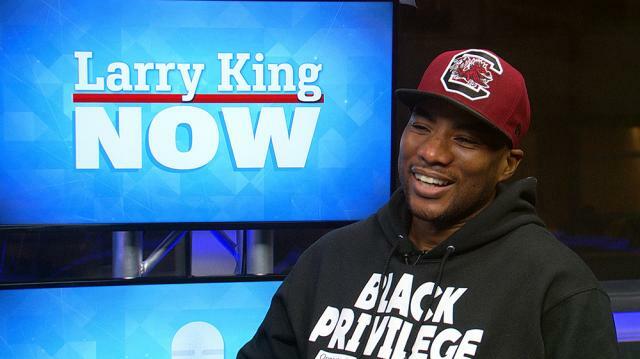 Charlamagne tha God: Nah, I wouldn’t co-host a show with her. And “friends” is a strong word, like we’re associates in the media game. Like she’s somebody that I had a conversation with because I saw the influence she was having, and she’s really young, so the influence she was having, she was spreading a lot of dangerous rhetoric about black people in general. I just wanted to have a conversation with her to let her know why her rhetoric is so dangerous, and maybe if you never had communication with a black person, you need to, so you can dispel some of those false narratives that you’re putting out there.